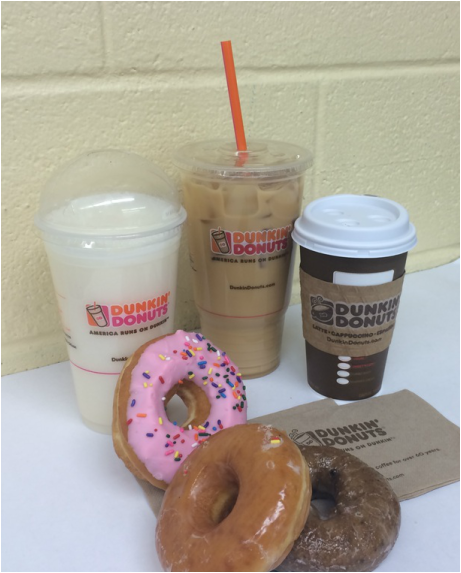 A typical Dunkin' Donuts run for the students at BEHS. If you walk the halls of Bonny Eagle High School, one thing becomes apparent: “Bonny Eagle Runs on Dunkin.’” You'll see many students, and even some staff, pass by with a cup or paper bag bearing the familiar orange and pink DD logo on the side. But while Dunkin' Donuts is a popular stop for students, is it a healthy habit? Some teenagers and young adults use coffee as a substitute for breakfast. Many skip breakfast in the morning, and just stop by their local Dunkin’ Donuts, get a coffee and go on their way, using coffee as their only energy booster. “I think stopping at DD is a poor choice because it is very costly. A better alternative would be to make your own coffee at home and bring in a travel mug. Make stopping at DD once a week your treat to yourself instead of a habit,” said Mrs. Diane York, the front office secretary here at Bonny Eagle High School. Just how bad a habit is it? A small Dunkaccino contains 240 calories, a small frozen french vanilla coffee Coolatta can be up to 490 calories, and a single donut ranges between 200 and 400 calories depending on what kind you choose; never mind all the other foods and drinks you can get there. When you are consuming these multiple times a week, the calories add up and are very unhealthy for anybody. “It’s unhealthy, but it tastes good and it keeps me going, so it’s worth it,” says Jillian Berry, a senior at BEHS. Not only is it an unhealthy habit, but going to Dunkin' Donuts on a regular basis is also an expensive habit. It may seem cheaper to stop by your local Dunkin’ and grab something to eat or drink, because you’re only spending a few dollars a day, but as the days go by, the cost adds up and it is actually more expensive than you may realize. If you have to go out of your way to make a Dunkin' stop it could be more difficult than you think. If you don’t leave early enough, making a run to Dunkin’ before school can interfere with your attendance. You have to plan ahead because there are days when the lines at Dunkin’ seem like they may never end. If you don’t give yourself enough time to sit in those lines, you are going to either be late to school, or you are going to have to leave without getting what you wanted.